High online visibility and ease of access via search engines are crucial factors for any start-up. Think that on Google alone, over 40,000 searches are being performed every second! This makes it very clear that in order to achieve good generation of traffic to your website you need to manage to rank high on search engine results’ pages so that prospective clients can find you easily and fast. For any start-up the two available routes to get to high rankings through targeting the keywords most related to their offering, product or service, is either via pay per click advertising or through search engine optimization. As shown by its name, in PPC advertising you essentially purchase visits to your site since each time your ad is clicked on, you pay a fee. Since many advertisers would like to rank high for the same keyword(s), the process entails placing a maximum bid in order to compete with the bids of other advertisers for each keyword. On search engine results’ pages PPC ads always appear first and are marked as an “Ad”, as shown in the example below. Paying to appear on top is the key difference and this is why organic rankings through SEO are often described as earned, as opposed to the PPC rankings which are paid for. Search Engine Optimization (SEO) earned placements on search engine results’ pages are ranked based on their overall performance by the search engine’s algorithm, which uses many parameters, but is primarily looking to determine and reward your website’s perceived relevancy and authority to a specific keyword. Through the use of specific strategies, techniques and tactics with technical and non-technical aspects, through SEO websites are able to rank highly on the search results pages of all search engines. Unlike the PPC rankings, SEO rankings are not marked as an “ad”, since they are earned and not purchased. 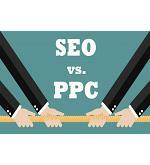 So, how to choose between SEO and PPC? Both the option of resorting to SEO as well as that of PPC come with different prons and cons and, especially in the case of start-ups, it is often difficult and complicated to decide on which of the two they should focus their available budget and effort. More specifically they need to decide which of the two will yield a better return on investment, which will bring about results faster and whether one of the two is trusted by consumers better. Complicated due to the many associated variables and steps involved. Simple. Can be easily setup within a few hours even by a first-time user. Low-Medium. Short gains and little traffic during the initial stages. High. The site continues to receive traffic for the whole period that the ad runs. High. 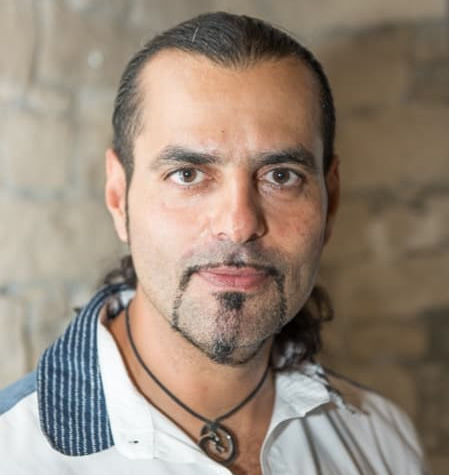 Each step strengthens the overall process and the consistent implementation of effective techniques over time brings results and success. Low. Although it is possible to improve and optimize the paid ads to enhance their performance in the long term, the corresponding budgets must also be renewed recycled each week/month to keep achieving the creation of new traffic. High. Consumers tend to trust organic rankings more since they view them as more relevant and trustworthy. Low. Consumers usually consider these ads to be purely commercial, less personal and less trustworthy. This is especially true for newer brands with which they are unfamiliar and thus more sceptical. Besides the points summarized above, it is also useful to take into account the findings of studies recording consumer behaviour when trying to decide between SEO and PPC. One such study, performed by BrightEdge has interestingly recorded that PPC accounts for 10% of website traffic, in contrast to organic search results which yield an impressive “51% of all website traffic”. It is undeniable that using PPC can bring traffic much faster than SEO, especially since search engines, such as Google, who will take your money if you submit the highest bid for a keyword, will strive to bring you as much traffic as they can. This is good, but it is often not enough, since clicks don’t always turn into purchases. In fact, it has been found that conversion rates for PPC ads are extremely low. Another factor to take into account is that the PPC space in each industry is limited and it is dominated by a handful of competitors who are the main players in the respective industry, making it far more difficult and expensive for a start-up to compete. To illustrate this with an example, let’s consider the case of an online start-up in the travel industry, attempting to set up a new PPC campaign. Based on data presented by Smart Insights, such a start-up would be getting a click through rate of 4,88% and a conversion rate of 1,45% at a cost per click of $0.29. Thus, in theory, a PPC budget of $290 would yield 1,000 clicks and 4 conversions. Alas, this is far from the truth since the established players in the industry such as Expedia, Priceline and others dominate the paid ads space, meaning much lower conversion rates for a start-up attempting to compete. The example above highlights the need for examining the size and gravity of your brand within your defined space and industry, especially because for most start-ups this is usually small, before deciding to choose PPC or SEO. 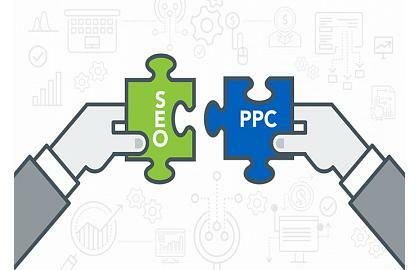 As already stated in our comparison table above the actual process of creating and launching a PPC ad on Google is quite simple and fast, while receiving impressions starts as soon as the submitted ad is approved. This is particularly useful for any start-up business which has specific, short-term traffic goals, such as wanting to promote a “limited time only offer” and aiming at traffic generation before the specific deal expires. Another instance when generating traffic fast via PPC is when wanting to test a new feature in real-world conditions to determine its effectiveness. Contrary to PPC, SEO is based on increasing search engine rankings naturally, through the gradual building of your brand’s reputation and authority, and as such it is not a quick fix but a more long-term process in the form of the multi-faceted strategy. Due to this reality, especially in the case of a start-up, if you are opting for SEO you need to be prepared to do a lot of groundwork and then have the patience to wait a few months before achieving noteworthy results. Therefore, if time is the determining factor, PPC is a clear winning because it can bring you more clicks, faster. Time however is not the only factor to consider, as the two routes need to compared on other characteristics as well. 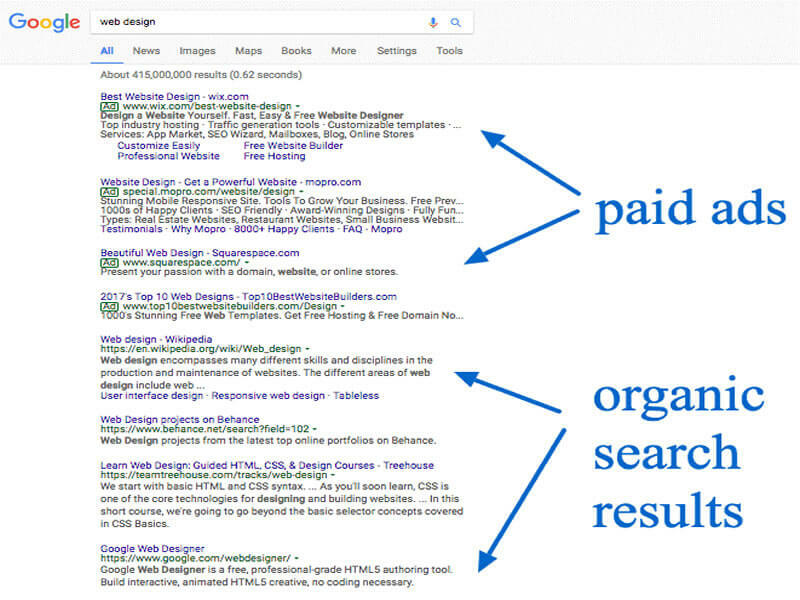 A very illuminating article published in SEOmoz reveals the great disparity between organic and paid results, since it proposes that organic results earn more than eight times more click than paid ad results! If we return to the travel star-up used as an example above, the $290 ad budget could be spent instead on SEO methods, such as identifying niche keywords in the travel industry and developing targeted, unique and valuable content for readers searching the specific keywords in an SEO optimized manner. In a few months the start-up would be able to organically rank high and this could lead to a potential 8.000 clicks instead of the 1.000 paid clicks had they chosen the PPC option. The difference is huge not only in the number but the quality and potential of the clicks as well. Perhaps the most crucial factor for a start-up attempting to answer the SEO Vs PPC dilemma is the element of consumer trust. Numerous consumer behaviour survey, such the one published in AdWeek, or the one performed by Nielsen show beyond doubt that consumers do not trust digital advertising and are mostly put off in their purchasing decisions when they see the “Ad” sign next to a search result. Instead they search online seeking for reliable and authoritative answers before committing to buy a product or service. Since clearly paid ads cannot buy consumer confidence and consumer trust is the primary need of any start-up, it becomes apparent that combining the two is problematic. Therefore, we can safely argue that a start-up stands a much better chance to compete with the already recognized industry leaders in the eyes of consumers and in terms of search engine results, not through PPC but instead through a strong content marketing plan and great SEO techniques that will allow it to optimize its content for significant keywords, build trust and attract better quality organic traffic. Once this target is attained and visibility and trust are built, then PPC can come into play to help boost conversions. Put simply, for start-ups it is not SEO or PPC but SEO and PPC together each at the right stage of the process to achieve maximum effectiveness and efficiency. Start-ups then are advised to resort to expert, professional help with their SEO, who will be in a position to guide them in recognizing the niche keywords to target and create the unique, high quality content that will help them earn the all-valuable consumer trust. In a nutshell, and since it is clear that start-ups will have a hard time competing on a PPC strategy alone, it is wiser for any start-up to opt for smart SEO techniques, with the right guidance, since these will allow success even on a low budget by identifying gaps in the market and effectively taking them into advantage. If you are a start-up owner, contact us today for a free consultation and let us show you how you can combine SEO and PPC to lead you to online success!